Mixing silica-overcoated gold nanorods (left) and iron oxide nanoparticles (center) yields iron oxide-overcoated gold nanorods (right). Credit: Brian Chapman. Gold nanorods are becoming more and more used in the production of security materials, as well as diagnostics, imaging, and cancer therapy equipment. They are also employed to advance catalysis processes. This week, scientists from MIT and North Carolina State University published a paper where they highlight a series of findings to make these materials more efficient. 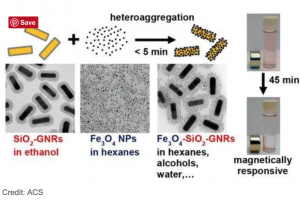 In detail, they discovered a simpler way to deposit magnetic iron oxide (magnetite) nanoparticles onto silica-coated gold nanorods, creating multifunctional nanoparticles with improved magnetic and optical properties. The reason why gold nanorods potential applications are vast is that they have a surface plasmon resonance — in other words, they can absorb and scatter light. Thus, by controlling the dimensions of the nanorods, specifically their aspect ratio (or length divided by diameter), the wavelength of the absorbed light can also be controlled. "The fact that the magnetite-gold nanoparticles can also be manipulated using a magnetic field enhances their potential usefulness for biomedical applications, such as diagnostic tools or photothermal therapeutics," read a press release by NC State University. The new technique described in the paper uses an approach called heteroaggregation. This means that silica-coated gold nanorods are dispersed in ethanol, which is a polar solvent. In ethanol, the hydrogen atoms are partially positively charged, and the oxygen atoms are partially negatively charged. The magnetite nanoparticles are dispersed in hexanes, a non-polar solvent, where the charges are not separated. When the two solutions are mixed, the magnetite nanoparticles bind to the gold nanorods – and the resulting magnetite-gold nanoparticles are removed from the solvent using a simple centrifugation process. “This is simpler than other techniques, which rely on either growing iron oxide nanoparticles on gold nanorods or using molecular cross-linkers to bind the iron to the silica coating of the nanorods," said Brian Chapman, the lead author of the study, in the media statement. 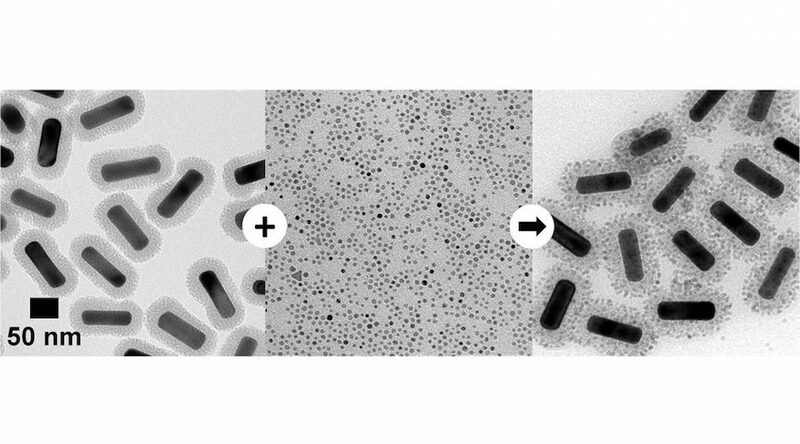 According to corresponding author Joe Tracy, this approach not only results in highly uniform nanoparticles, but also allows to incorporate ligands called PEG-catechols and the resulting nanoparticles can be dispersed in water. This makes them more useful for biomedical applications.